How Does My XMod Affect my Workers Compensation Premium? An important component of the workers comp system called the “Experience Modification Rate” or XMod, rewards companies with lower premium for above average management of worker compensation claims. The rating penalizes businesses that have little or no control over their claims process by charging them higher premiums. Business owners and management come under tremendous pressure to cut costs and protect the company’s assets. They must play an active role in managing business risks, protecting company assets and controlling expenses. With worker comp rates on the rise, familiarizing yourself with your XMod can put you on the road to making the necessary safety improvements to reduce claims and drive down your score. The XMod functions as an indicator that gauges the “health” of your company, much like a persons credit score. Your credit score determines the interest rate you are going to pay for a loan. Your XMod determines the amount of premium you are going to charged by the insurance company for your policy period, typically one year. The Workers’ Compensation Insurance Rating Bureau of California (WCIRB) calculates the XMod rating. The nonprofit WCIRB membership roll consists of over 400 companies licensed to conduct Workers’ Compensation Insurance in California. The calculation makes a statistical comparison of the number of injury claims for a company compared to the average number of injury claims for similar size companies in that industry classification. The formula aggregates data from Californian companies over a given period, typically 3 years. It is adjusted to take into account a higher percent of small claim values than large claims. 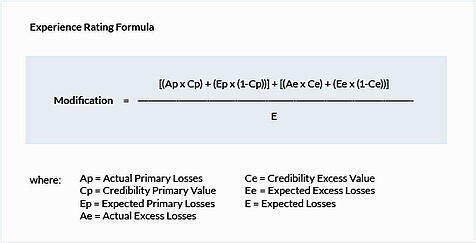 To determine the actual xmod, your expected losses are calculated against your actual losses. The formula below gives you an idea of the complexity of the calculation. The XMod give insurers an indication of the potential risks and financial losses associated with offering a particular business workers’ comp coverage. If your business has an XMod of 100%, the premium amount will not be adjusted up or down by the insurance provider. The WCIRB has a great resource to explain your experience modification rating sheet like this one below. Business owners know that a serious injury to an employee can trigger a Cal/OSHA Inspection. However you can also be subjected to an inspection and a fine if your XMod rate is 1.25 (125%) or higher. The fine is calculated on your workers compensation payroll amount and can range from $100 to $10,000. You should also evaluate you current process for managing claims. Best practices include taking an active part in the management of each claim. You can also implement a program designed to reduce the length of claims and your total costs. Business owners can conduct an audit of their current x-mod to verify its accuracy. Inaccurate data or errors used in the calculation can have a significant impact on the insurance premiums for a number of years. An experienced broker can audit your XMod and to determine factors that may negatively affect the premium you pay, including inaccurate payroll amounts, claims wrongly assigned to your business, changes in claims status and other errors.